Jay S. Levy is a social worker with over twenty years of experience reaching out to the increasing number of homeless people living in our nation. With a degree in social work from Columbia University and years of experience working with social service agencies in New York and Massachusetts, Levy has experienced the frustration of working in a system whose procedures sometimes prevent helping members of our society who need it most–those who are homeless, poor, jobless, suffering from medical conditions, trauma and/or substance-dependency. 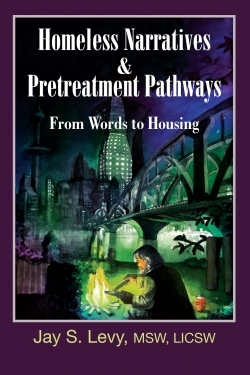 In a brief volume that focuses on the simple concept of “Housing First,” Levy makes the commonsense and well-documented case that we can’t hold our homeless to behavioral treatment goals such as sobriety and self-sufficiency without providing them with safety and shelter first. As part of the New Horizons in Therapy Series, this book is an initial how-to manual with poignant stories of Levy’s clients that offers outreach workers basic guidelines on how to connect with persons who are sometimes difficult to find and often reluctant to accept help. Whether living in the woods, under bridges, in abandoned structures and vehicles, and on the streets, or able to gain part-time admission to housing shelters, persons experiencing homelessness and housing instability are vulnerable to weather, hunger, illness, fatigue, isolation, crime, assault, trauma, and mental illness. In 2009, the US Department of Housing and Urban Development “homeless point-in-time count” reported over 643,000 persons composed of 63% individuals and 37% families and children on any given day. The situation continues to worsen. In 2010, HUD estimated that over 1.5 million Americans were in fact seeking shelter throughout the year. Given the enormous and increasing budget cuts facing these historically tax-supported programs, this epidemic of homelessness forces us to care for one another in creative ways that are unprecedented in recent memory. For this pressing reason, Levy’s book presents a pretreatment model for action that is becoming necessary reading as narrative for improving policy, supervision, and outreach counseling services for the most vulnerable among us.